The Tiger Belly Bouncer is another great offering from Magic With A Twist. Watch as the kids laugh and giggle as they bounce on the belly of this king of the jungle. This bouncer is 16� wide by 25� long and 16� tall. This unit features childproof netting to keep out even the smallest fingers. 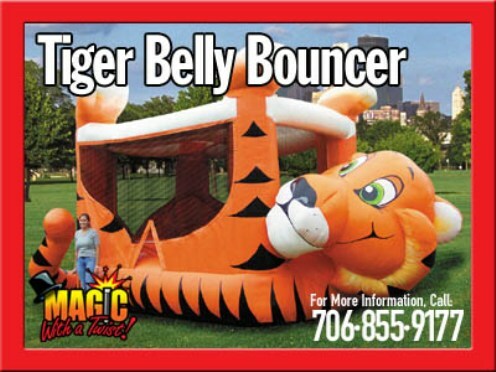 This unit also has a double safety door to keep the children safe while bouncing on this enormous tiger. The Tiger Belly Bouncer requires a relatively flat area about 18� x 30' and within 100' of an electrical outlet. This unit has a weight limit of 150 pounds per child.